What’s the best gift to give a teen boy? That’s a tough question. Choosing the best games for teenagers is always a challenge. If you’re a parent, then you know that they don’t need anymore attitude. They think they already have all the answers, so they don’t need those. And, they definitely don’t need more time on their screens. What they do need is more time outside, more time interacting with their friends, more time being active and more time away from their video games. It’s a challenge to fulfill those needs with a gift that is still fun and exciting to them, but it just takes a little creativity. Next time that you’re on the hunt for a gift for teen boys, check out this handy gift guide for boys ages 13 to 16. It’s recommended that teens get at least 60 minutes of physical activity every day, yet many teens don’t get near that amount. One way to keep your teen boys motivated to stay active is to choose a gift that gets them away from their phones and tablets and up and moving. The Elite Hookey Ring Toss Game (available on amazon) is just this kind of gift. You just hang it on a wall inside or out, and start playing. It’s a fun alternative to darts that’s safe, challenging and somewhat addictive…the perfect thing for boys. The set contains one game board, six black and six red rings, as well as instructions to play with a few variations. It truly makes a unique and exciting gift for boys. As a bonus, it’s beautifully finished game board that looks great hanging in any game room or family room. Studies show that social interaction in teen years is important for both mental and physical health and well-being. Socially active teens are more physically healthy because their social relationships help them cope with the stress and pressure of teenage life. One of the best gifts that you can give a teen boy is something that fosters these relationships. Choose a game that involves their friends, laughter, and a little craziness. “Not Parent Approved” (available on amazon) is a hilarious word game of fill-in-the blanks fits this description. It’s a card game that was inspired by Cards Against Humanity but is 100% family-friendly. With Not Parent Approved, your teens get to act a little mischievous without getting into real trouble, spend social time with their friends, express their creativity with some wacky humor and laugh at some good jokes and themselves. The game comes with 455 durable cards that you can take anywhere like parties, sleepovers, and road trips. This winner of Scholastic’s Gold Star Toy Award. It’s easy-to-learn, simple play and a whole lot of crazy fun! It’s a fact, spending time outdoors reduces levels of stress, anxiety and depression. It’s important for teens to take time to be unplugged and out in nature to help regulate their mood and restore their mental energy. Of course, fun gifts for boys have always included nature-inspired equipment such as binoculars, flashlights, and camping gear. Another great idea is a KingCamp Outdoor Camping Hammock (available on amazon). Boys love these portable hammocks for road trips or even their own backyard. This one is a breathable lightweight mesh hammock with metal hood ropes that make it stable and easy to install. It’s ideal for backpacking, camping, and napping – all the things that boys love to do. Plus, the storage bag for the hammock can also attach to the side of it to store phones, books and small items. It’s easy to pack and carry, easy to set up and easy to kick back and soak in some fresh air and nature. Teenage boys love competition. If there is someone to be defeated or bragging rights to be won, then they are all in. And, there are so many fun games that encourage healthy competition and friendly rivalry. The Bounce Battle Premium Wood Edition Game Set (available on amazon) is all that. It’s a easy-to-learn game of skill, strategy and chance. And, it’s quite addictive. You simply pick your color, choose a battle and then bounce in to win. You can play with multiple players, one-on-one, in teams or tournament style. The set includes one wood game cube, 27 high quality white and orange balls (one extra), and instructions for dozens of ways to play including 3D Tic-Tac-Toe, Nine Cup, Level Out, Point Ball, Alphabet Soup, H-O-R-S-E, and more. Simply place the game cube squarely on a solid table or the floor, position yourself very close to the cube on the opposite side of your opponent, get creative and have fun. Sometimes you hit the jackpot with a gift that gives it all. 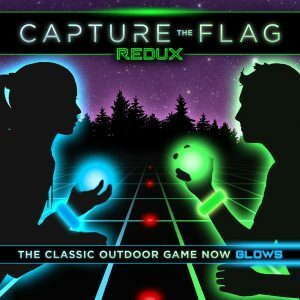 That’s Capture the Flag REDUX, the ultimate outdoor, active, and socially interactive competition. It’s the classic Capture the Flag game revolutionized with futuristic glow-in-the-dark lights. And, it’s a perfect gift for teen boys to keep them busy as they break teammates out of jail, sneak into enemy territory, protect base and steal the glowing flag to win. 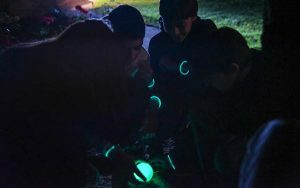 The game box includes two glowing orbs to use as the “flags,” color-coded LED bracelets to differentiate team members, glowing jail markers, and a rule-book. As an extra bonus, each kit includes 12 game variation cards that offer even more ways to play Capture the Flag, as well as other games. If you’re looking for a cool boy gift idea or a fun activity for teen parties, Capture the Flag REDUX is the easy choice. If you’ve ever shopped for birthday gifts for boys ages 13-15, then you know exactly how hard it can be! You never seem to know what they like from week to week and they grow out of clothes so quickly. You don’t want to get them video games either, because they’re already constantly attached to their screen. So, what do you get a teenage boy as a present when you’re looking for something that they’ll enjoy and you’ll feel good about, too? These birthday gifts for young teenage boys are foolproof ways to really knock it out of the park. If your birthday boy is the adventurer type, this gift is the perfect combination of technology and activity providing him with an excuse to get off of the couch and explore the world. The GoPro HERO4 is an action camera that can mount to a helmet, be carried around on a Monopole, or mounted onto a handlebar. It features a touch display for easy use, and is simple to understand. This gift will allow him to create cinema quality videos from his own perspective and take on the world. Encourage the explorer in your teen by giving him a gift that will not only be memorable, but also allow him to create his own memories.This game is available at amazon.com. Just about every boy has played with LEGOs at one time or another, but this set takes LEGOs to a whole new level. This set allows for him to build an intricate model of the Chicago skyline featuring the John Hancock Center, the Cloud Gate, and the Willis Tower. This is a fun way to engage the creative side of your teenager’s brain and adds a cool touch of culture to his life. The set includes easy-to-follow, step-by-step instructions. And, the best part about this gift is that when he is done with the fun of building it, he’ll have a sense of pride and his own miniature Chicago skyline. This game is available at amazon.com. Looking for a birthday gift for boys ages 13-15 that will keep them active even after the sun goes down? Capture the Flag REDUX is the perfect choice. This game puts a new twist on the classic Capture the Flag game and features futuristic light-up gameplay pieces that keep the fun going at night. The game comes with two “flags” that are glowing orbs, LED color-coded bracelets to designate the two different teams, and light-up markers that show the boundaries and the jails. The game box also includes a rule-book, and 12 game variation cards that can be used to change the Capture the Flag game or create an entirely new game. This game is the perfect way to keep your teens active and having fun at all hours. Available for purchase here at Starlux Games. For those teens that have a little too much energy and seem to constantly be kicking or tossing a ball around, the Hover Soccer Ball is the perfect gift. This ball lights up with LED lights that make playing in the light or the dark easy and fun. Since it easily floats across any surfaces, the hover soccer ball is suitable for indoor play as well. The foam edges on the ball make it the perfect gift for parents too, since they don’t have to worry about balls banging into tables or chairs anymore. It even comes with two easy to setup goals so that you can play anywhere at anytime.This game is available at amazon.com. Kids this age are just starting to find their own voice through music, and there’s no better way to encourage kids to keep exploring different kinds of music than with the gift of a wireless speaker. Bluetooth speakers come in all sorts of shapes and sizes, and you can even find waterproof ones that are suitable for pool parties. Teens won’t be “plugged out” with their headphones in, but rather encouraged to share their music by playing it out loud. Some wireless speakers can really break the bank, but there are others like the Divoom Voombox Wireless Speaker which end up being a much more reasonable price while still delivering stereo quality sound. This speaker comes with a rechargeable battery that is good for 12 hours of play-time and is splash resistant. This game is available at amazon.com. Boys this age have become enamored with movies (Star Wars) and comic books about superheroes and warriors doing battle, and this is the perfect gift to help them feel like they can be a part of the action. 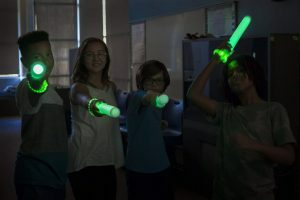 In this intense glowing game, players wield light-up, harmless, glowing sabers which are used to attack the opponent, defend yourself, and win the match. This game involves strategizing with your team in order to thwart your foes, maintaining your position, and leading your squad to victory. The game comes with light-up bracelets that serve as the target and a way to distinguish teams and the glowing sabers. Hit your opponent’s bracelet once and they have to go back to their home base to recharge. Hit their bracelet twice and they’re out of the game. Join the 426 Kickstarter backers in this exciting new game that allows for any teen to feel like he’s in an action movie. Available here at Starlux Games. Looking for a fun board or card game to get your teens for their birthday? Look no further than Goat Lords, the hilarious and competitive new card game that pits players against each other in the attempt to build the best herd possible. Draw cards, try to steal goats from other players, and draw insane action cards to win and become the official Lord of the Goats. Goat Lords is the ideal strategic card game requiring quick thinking to build your herd to be as large as possible. This game is a great way to not only keep your teens away from the screen, but is also a great party game for all ages. It allows for other friends or family members to join in. This game is available at amazon.com. It can be a challenge to find the perfect birthday gifts for boys, especially for boys ages 10 to 12. The old saying goes “boys will be boys,” but really no two boys are alike. You can dress them in matching outfits, raise them in the same household – they can even be twins – and each one is going to have his own personality. When it comes to birthday gifts for boys, it’s important to consider their individual personalities to find the perfect match. Some boys love science, some are sports crazed and some are free spirits that just want to run around. Check out these top gift ideas to match the personality of your birthday boy. Maybe you’ve heard of a chemistry set, but this is something new. The Physic Workshop includes 36 models, 37 experiments and an easy-to-follow manual that let them discover amazing real-world applications for physics. They can explore concepts like gravity, momentum, and acceleration with a fun hands-on approach. The workshop lets them experiment with gears and simple machines, build a wind power generator, create their own pin ball game and much more. This is gift is phenomenal for all of your curious boys who want to know more about how the world works around them. Available for purchase here. While you may think soccer should stay outside, this isn’t the soccer that you’re used to. In a new take on the classic game, this soccer disk glides over any surface on a cushion of air and lights up. Its powerful LED lights combined with its soft foam cushion are suitable for indoor and outdoor play and are the perfect gift for your sporty 10 to 12-year-old. This new twist on soccer is a great way for your kids to have fun while exercising, even in the dark! This gift is sure to keep your boys engaged and active while the foam cushion protects your furniture, making it a gift everyone will love. You can purchase it here. If you have a swimming pool, you already know that boys love playing swimming games. Starlight Swimming Games offers a game kit with 10 different swimming games and waterproof glow in the dark game pieces. This makes playing in your swimming pool at night a blast as well as providing great exercise. You will love that after they play Starlight Swimming Games, they will be exhausted and sleep very well. And who knows, maybe these games will prepare your son to become the next Michael Phelps! 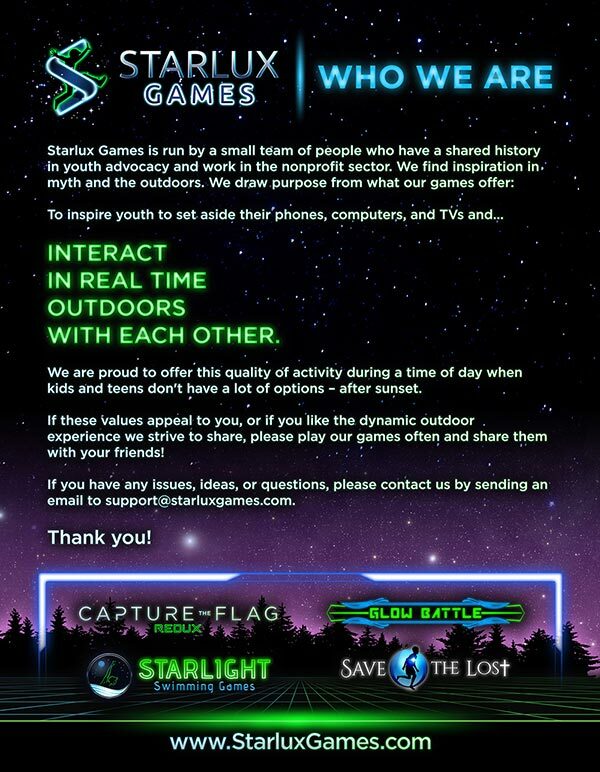 Learn more and purchase Starlight Swimming Games here. Let’s face it, superheroes are all the rage, but finding a superhero gift that doesn’t involve your child staring at a TV or computer screen is a challenge. With the Lulu Jr. My Comic Book Kit, you can design your own comic book story and create adventures for yourself. The kit comes with an 18 page ready-to-use comic book, a pencil and artist eraser, an outline pen, and markers to help make your work look stunning and engage your creativity. In addition to the set, you get instructions and a postage-paid envelope so that you can get your very own comic book professionally printed. This way, your child’s work will look just like the real thing. Available for purchase on amazon.com. It’s safe to say that most boys like to keep moving around the clock. Just because the sun goes down, doesn’t mean they want to. Capture the Flag REDUX is the perfect thing to keep them moving after dark. It’s a hot new take on the classic Capture the Flag that features futuristic lights and glowing orbs to use as flags. LED color-coded bracelets mark which team you’re on, light up markers designate each team’s territory and jails, and cool game variation cards can be used to switch up how you play so you can play a bunch of different ways. Each box includes the glowing orbs as “flags,” light up wristbands and markers, a rule-book, and 12 game variation cards. This game is the perfect birthday gift for boys and is an awesome way to keep your night owls happy. Buy it online here. The best birthday gifts for boys are those that will grow with them as they grow. The Vega 360 Telescope is just that. This gift combines science with absolute amazement. This telescope is small enough to pack up and take with you on all of your stargazing adventures, but the perfect size so that you’ll never miss any of those magical moments in the night sky. The 50-mm refractor telescope comes with two eyepieces and to image-erecting eyepieces that help your birthday boy look at things on Earth without the pain of seeing everything upside down. This is a great gift for the curious-minded boy who wants to explore the mysteries of space. Available for purchase here. Boys this age are always on the move, and this intense glowing game uses all of that raw energy. It lets them unleash their inner warrior and team up with friends and family to defeat the enemy. Run at your opponent, attack your foes, defend your position, and strategize with your team in order to achieve Glow Battle glory. This is the perfect game for getting boys off of their electronics and up and moving outdoors! Teams play with harmless glowing weapons and use strategy and teamwork to help lead their side to a victory. Join the hundreds of Kickstarter backers in this awesome new game that lets your children move around and have a ton of fun. It may even be so much fun that you’ll want to join in yourself! Available for purchase here. You’ve never seen slime fly like this! This high-tech slime-slinging device launches slimeballs into the air and sends them flying towards their targets. Simply grab the gel handle, place one of the balls into the bungee net, yank it back, and watch it fly. The precise slime-slinging device is made to launch the slime up to thirty feet in the air and the device’s design is made to enhance accuracy. This gift may sound gross but it’s actually a parent favorite. The slimeballs are made from soft non-stick rubber that’s made to look and feel like real slime, and are completely safe to use. The package comes with the precision slime slingshot with gel handle and mesh bungee net and two slimeballs. You can find the Slimeball Slinger here.